Researchers have demonstrated proof of concept for a novel low-energy nuclear reaction imaging technique designed to detect the presence of "special nuclear materials"—weapons-grade uranium and plutonium—in cargo containers arriving at U.S. ports. The method relies on a combination of neutrons and high-energy photons to detect shielded radioactive materials inside the containers. The technique can simultaneously measure the suspected material's density and atomic number using mono-energetic gamma ray imaging, while confirming the presence of special nuclear materials by observing their unique delayed neutron emission signature. The mono-energetic nature of the novel radiation source could result in a lower radiation dose as compared to conventionally employed methods. As a result, the technique could increase the detection performance while avoiding harm to electronics and other cargo that may be sensitive to radiation. If the technique can be scaled up and proven under real inspection conditions, it could significantly improve the ability to prevent the smuggling of dangerous nuclear materials and their potential diversion to terrorist groups. Supported the National Science Foundation and the U.S. Department of Homeland Security, the research was reported April 18, 2016 in the Nature journal Scientific Reports. Scientists from the Georgia Institute of Technology, the University of Michigan, and the Pennsylvania State University conducted this research, which is believed to be the first successful effort to identify and image uranium using this approach. 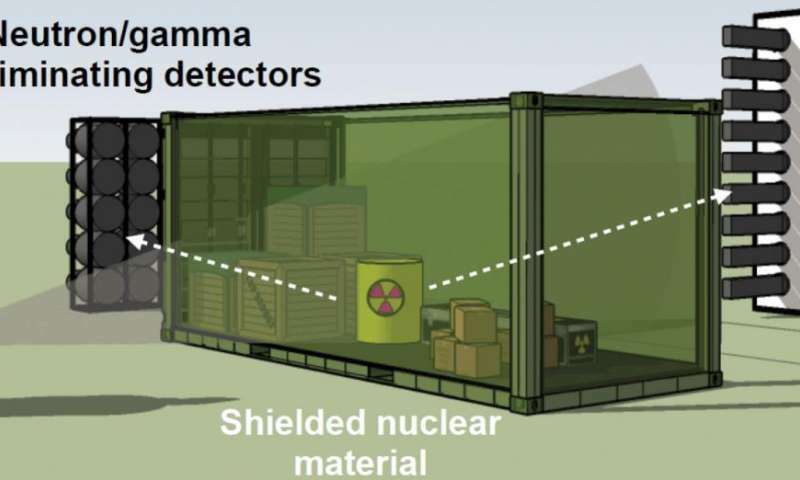 "Once heavy shielding is placed around weapons-grade uranium or plutonium, detecting them passively using radiation detectors surrounding a 40-foot cargo container is very difficult," said Anna Erickson, an assistant professor in Georgia Tech's George W. Woodruff School of Mechanical Engineering. "One way to deal with this challenge is to induce the emission of an intense, penetrating radiation signal in the material, which requires an external source of radiation." The technique begins with an ion accelerator producing deuterons, heavy isotopes of hydrogen. The deuterons impinge on a target composed of boron, which produces both neutrons and high-energy photons. The resulting particles are focused into a fan shaped beam that could be used to scan the cargo container. The transmission of high-energy photons can be used to image materials inside the cargo container, while both the photons and neutrons excite the special nuclear material—which then emits gamma rays and neutrons that can be detected outside the container. Transmission imaging detectors located in the line of sight of the interrogating fan beam of photons create the image of the cargo. "The gamma rays of different energies interact with the material in very different ways, and how the signals are attenuated will be a very good indicator of what the atomic number of the hidden material is, and its potential density," Erickson explained. "We can observe the characteristics of transmission of these particles to understand what we are looking at." When the neutrons interact with fissile materials, they initiate a fission reaction, generating both prompt and delayed neutrons that can be detected despite the shielding. 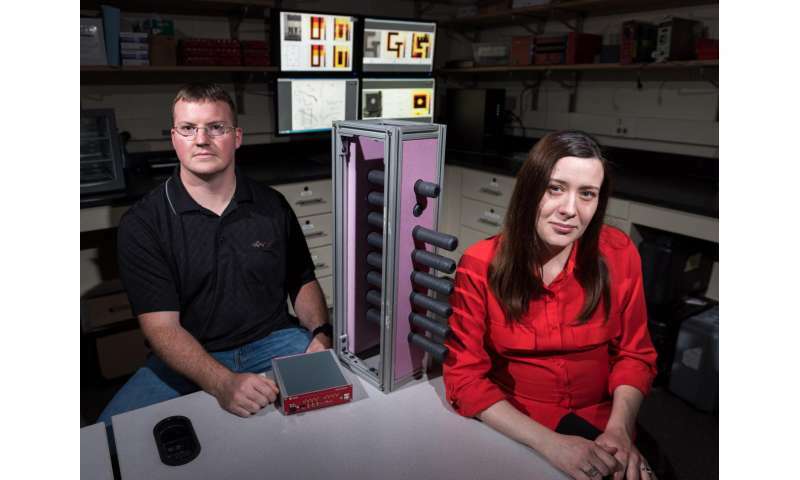 The neutrons do not prompt a time-delayed reaction with non-fissionable materials such as lead, providing an indicator that materials of potential use for development of nuclear weapons are inside the shielding. "If you have something benign, but heavy—like tungsten, for instance—versus something heavy and shielded like uranium, we can tell from the signatures of the neutrons," Erickson said. "We can see the signature of special nuclear materials very clearly in the form of delayed neutrons. This happens only if there are special nuclear materials present." Earlier efforts at active detection of radioactive materials used X-rays to image the cargo containers, but that technique had difficulty with the heavy shielding and could harm the cargo if the radiation dose was high, Erickson said. Because it uses discrete energies of the photons and neutrons, the new technique minimizes the amount of energy entering the container. Researchers at Georgia Tech—led by Erickson—and at University of Michigan and Penn State University—led by Igor Jovanovic, professor of nuclear engineering and radiological sciences - demonstrated that the technique works in a laboratory setting by detecting uranium plates and rods. In testing conducted in collaboration with the Massachusetts Institute of Technology at the Bates Linear Accelerator Center, the researchers used a fan-like pattern of particles created by an ion accelerator and emitted at 4.4 and 15.1 MeV. The particles passed through a shielded radioactive material, and were measured on the other side with Cherenkov quartz detectors connected to photomultiplier tubes. "This provided proof that the physics works, and that we can use these particles to actually distinguish among various materials, including special nuclear materials," Jovanovic said. The technique has not yet been tested under the real-world conditions of a steel cargo container, but such demonstration may take place in the near future. it will ruin electronics in those containers. ultrasound might be usable to detect high density elements. can a vacuum insulator container by imaged as a shadow against the background? It would be suspicious. It would show up as a substance that doesn't transmit ultrasound. But there are plenty of those. Any kind of foam would look the same. Basically any material that has a gazillion material interfaces is pretty much impermeable to ultrasound...e.g. a container of grain or rice. Also with ultrasound there is a very harsh relationship between frequency and penetration depth (under optimal conditions): E.g. medical ultrasound with high frequency has a much lower penetration depth (typically only several centimeters) than lower frequency ultrasound. The lower your frequency the lower your spatial resolution. Medical ultrasound works well because most of the human body has a similar complex wave impedance (since we're mostly water). A container with radically disparate materials would be infintely worse to image properly - even if you up the energy.